To plumb, or not to plumb? Currently I'm helping to plan Opportunity Village Eugene's next project, Emerald Village. 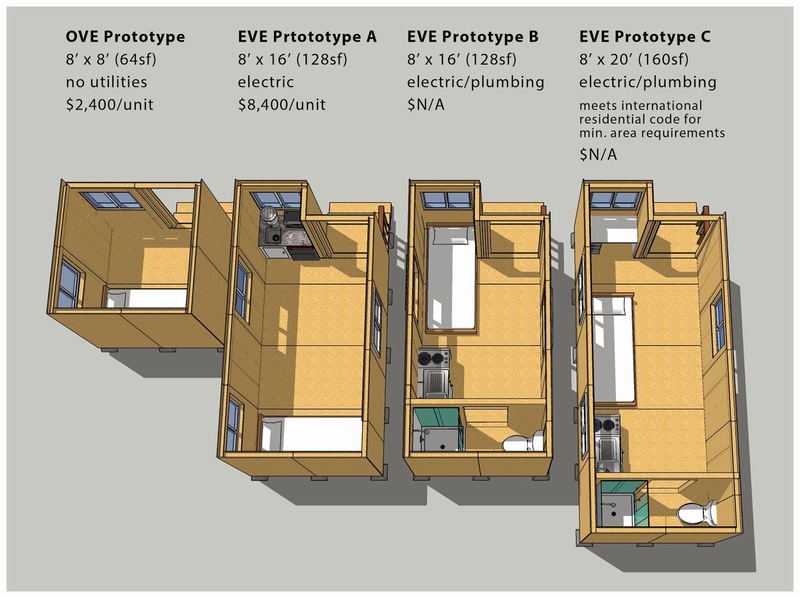 The affordable tiny house community has been moving along quite smoothly in terms of concept development, fundraising, and political support—though we've recently hit a snag in the decision making process. Our current dilemma revolves around whether or not to plumb the individual tiny houses at Emerald Village, or to utilize a common bathhouse similar to Opportunity Village. At Opportunity Village, a transitional tiny house community that has been open for one year, the housing units do not have utility hook-ups. They are small, private rooms that are instead supported by shared kitchen, bathroom, and gathering facilities (much like the once popular SRO hotels). The philosophy behind this was simple—we wanted to get as many people off the street as soon as possible, which also meant with very little money (the entire 30-unit village was built for $100k). The fact that utility hook-ups were consolidated in just a few buildings eased permitting complexities of the tiny houses, and allowed us to get on site much sooner. Furthermore, many have pointed out that there is a social benefit to the common facilities. It keeps folks from isolating themselves in their tiny homes, and instead encourages engagement in a self-governed community. The implications of a model like this are tremendous. This was well articulated in an e-mail I recently received from Seth Zeren in Boston: "...I've been struck by how much we middle class types have become mere consumers of the city, not producers or maintainers of our urbanity. The intense professionalization and othering of the development world means that many citizen activists have no voice other than protest to influence the evolution of their city. My hope is that by showing that even non-professionals, non-wealthy citizen can make a mark on the city we can heal the rifts that are creating barriers to change." Now, with Emerald Village, we planned to reduce the dependence on common facilities without eliminating it. This involved doubling the square footage of the units and adding electrical wiring to support a kitchenette and heat. But recently, in meeting with various city officials and community leaders, we have received feedback that plumbing, too, should be a must. Specifically we've heard that the average person will not consider it "a real house" unless it is "self-contained." I've also seen this attitude reflected in the narrative told by the recent media coverage on this topic—especially with the amount of attention that Portland is getting without having done much, aside from showing a tiny house rendering that included an in-unit kitchen and bathroom. This leaves us with a tough decision. I think we all agree that plumbing the houses would be a good thing for improving the quality of life at the next village, but we're also wondering, at what cost? Will it jeopardize our grassroots approach founded on volunteerism and modest private funding? Plumbing adds a lot of cost and formalities to the table. Not just in the infrastructure additions, but more so indirectly in the resulting site development costs and city reviews and fees, such as system development charges (SDC). These costs could necessitate federal funding, and in doing so, would limit these projects in a similar way as traditional affordable housing and rental subsidies, which is consistently underfunded in the U.S. The project would still be dramatically cheaper than conventional projects (as seen with Olympia's Quixote Village), though this would be primarily a result of a reduced physical footprint rather than a project led by non-professionals. It also makes me wonder—have we forgotten the common use of outhouses in the U.S. in the not so distant past? Or that most of the world still relies on this method? And we are talking about flush toilets. Co-locating them in one facility rather than in each unit may be an inconvenience, but it is difficult for me to buy into the idea that it is substandard or inhumane. This is the exact kind of logic that has led to the prevalence of homelessness in American culture. By limiting the definition of "home" to middle-class standards, the gap between the street and housing has been continued to inflate. So we are still left with this dilemma: More housing or more plumbing? Do we add more plumbing and earn wider public acceptance of the tiny house village on a national scale? Or do we continue to push cultural norms in an effort to provide more housing and influence wide scale change? One thing I know for sure is that the difference between homelessness and a home without in-unit plumbing is far greater than the difference between the latter and a home with in-unit plumbing. Would it be possible to build half of the units with utilities and half without? Perhaps the part without could be designed so as to facilitate the addition of utilities at some future time if needed. This would provide excellent feedback, and might be eligible for grant funding. I think that could be a great idea, and I'd be interested to see which one was more popular since the units that started without would likely be cheaper per month. The only down side I see here is that we would still have to build the common restroom facility for those who started without, which would then become obsolete if we ended up plumbing them all. But if enough people opted to stay with utilizing the common facility long-term it could be worth it. Could a common facility be built but designed to be easily re-purposed at later date for a fitness center or school-room? The shower pans and sinks and toilets and plumbing could even be re-used for tiny houses in the next village. That way you can get more of the small units on site and serve more people right away, but still have the ability to transition to an affordable home park down the road. Does the city or EWEB ever suspend/donate SDCs? What about multiple plumbing areas? Could be more convenient and private than a single and could offer redundancy if there is a clog or burst. Without being as expensive as having one in every unit. What do potential residents want? Seeing if we can get SDCs waived is definitely something we will be looking into. I spoke with a number of potential residents from Op. VIllage about this and they pretty much unanimously agreed that they would prefer the common bath facility. They were very practical about it, thinking about the long-term picture, and the ability to house more people and create more villages by keeping things simple. From what I've heard so far, the people that think plumbing each unit is a necessity seem to be the people that wouldn't ever be living there. The self contained facilities could be for the higher functioning people who are homeless due to convictions so they cant find housing or for other reasons not involving mental health or substance abuse. The common facilities housing could be for those who require extra assistance. Could using solar panels and generators be used for heat and other electrics. A composting toilet and rain collection systems could be used for extra water.